On July 7, 2011, Ambassador Charles H. Rivkin and his wife Susan Tolson welcomed 3000 guests to a Fourth of July Garden Party in Paris to celebrate the 235th anniversary of American Independence. American soprano Renée Fleming with the Dipnotes Choir sang during the festivities. The embassy also had some Glee stars. More photos here. Below is the best video I could find. At US Embassy Switzerland, Quincy Jones was the top celebrity guest of Ambassador and Mrs. Donald S. Beyer Jr. in Bern. Also in attendance, Elvis Presley and the Blues Brothers!! 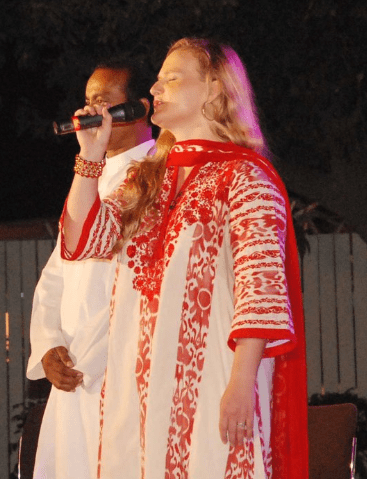 At the US Consulate General in Karachi, Information Officer, Andie DeArment sings the national anthem during the 4th of July reception in Pakistan. And at the US Embassy in Dakar, Senegal, former lawyer, opera singer and now Foreign Service Officer Levi Smylie sings the national anthem at the embassy’s 4th of July event. Beautiful!